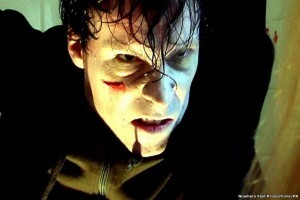 The British indie horror movie Colin, a surprise fan favorite at Cannes in 2009 and other film festivals, was reportedly produced for a total of $75 US dollars. So does that mean if supplier Walking Shadows sells a half-dozen copies, then the entire production is in the black? If that’s the case, then someone oughta tell the accountants in Hollywood about i! Colin is a contemporary, rough-hewn take on the familiar zombie saga, but with a gratifying twist. The story is told, for the most part, from the point of view of the titular Colin (Alastair Kirton), a newbie zombie, as he descends into the decaying, mindless, viscera-chomping caricature we’ve come to know over the course of, oh, 237-odd movies. Thanks to digital footage doctored to look like cheap filmstock, lots of jump-cut editing and the occasional (intentionally washed out) lighting, Colin is more akin to the very early George Romero (Survival of the Dead) oeuvre than, say, the slick flash of Zombieland. It’s refreshing, it is. Despite the dodgy production values, or at least the reported lack of a budget, the movie is compelling in a very odd way. 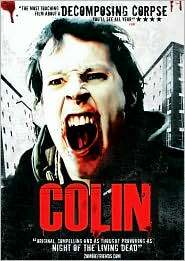 While the character of Colin doesn’t quite capture us with his zombie-fied humanity, his scenario is enough to let the mind wander to fresh cinema territory. There also are some real creepy chills, particularly a scene in which a living victim is trapped in a dark basement full of blind zombies. Yikes. Credit some of the creeps to the minimalist electronic music, the vivid, entrails-yanking SFX and some very cagey performances by volunteer actors. Great? Nah, but a great amateur effort and entirely appropriate as background for an adult Halloween costume party. The second disc of bonus material on the DVD boasts a nicely composed, 35-minute making-of featurette and a group of understandably deleted scenes, in addition to director Marc Price’s new short film The End.